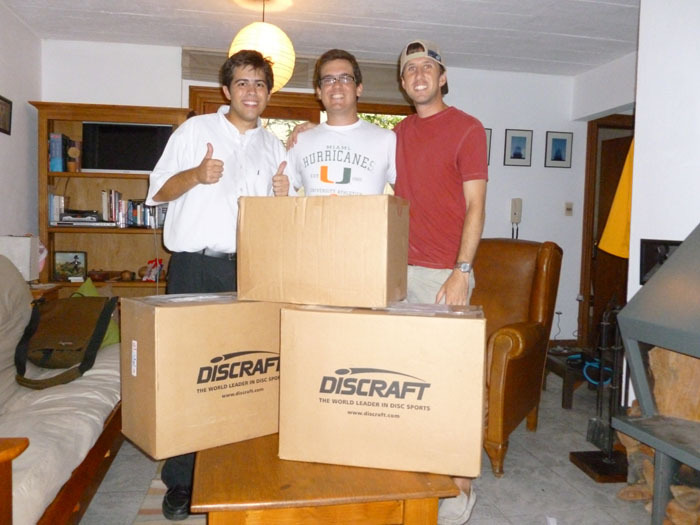 The Atlanta Flying Disc Club donated 80 discs so that we can help spread Ultimate Frisbee in Uruguay and throughout South America. It took about three weeks for the discs to arrive. Once they arrived, we received a couple letters from customs at our door saying we needed to pick them up. We had no clue where customs was. There was an address at the top of the letter, but nothing indicating where we needed to go or what we needed to do. After making a decision to go to the address on the letter, I headed off on a journey like Indiana Jones, but without the whip (it might be slightly intimidating to the customs agents) and hopefully without the danger… So I guess it’s nothing like Indiana Jones. The shipment was in Asa and Randi’s name so they signed over the paperwork because they had some things to do. I called Carlos, a friend that is fluent in Spanish and plays ultimate frisbee down here, to see if he could help. He was able to meet at 3:30pm to help out so we could go in and pick up the three packages. I arrive at the post office and Carlos notified me that he was coming with two other friends. They were a little late due to waiting for a while for a bus. Since customs closes at 4pm so I went ahead and went in customs to figure it out before they closed. I was hoping that Carlos and friends would make it in time to help me out in case there were any issues. As I went inside, I started mentally preparing for the random questions about pricing, why my friends aren’t here to pick them up with me, and anything else they might ask. There was an open waiting room with a few people standing at the counter getting packages and about twice as many workers behind the counters standing around. I waited my turn to hand a worker the papers and waited as he went into the back to retrieve the boxes. This was a huge moment! We were waiting for the discs to come in and they were finally here. Once he came back with the boxes, I figured everything was a go and the discs would be given to us. The worker only spoke Spanish. This was going to be difficult. Right as the customs agent asked for the receipt, he saw the invoice attached to the box. He opened the little plastic package for the receipt to look at it. Right when he looked at the final price, he gave me a confused look and said he couldn’t give me the boxes. I asked him why not and what the problem was, but he kept pointing to the price on the invoice. I was confused. I figured I’d have to pay some money (an import tax) and then I could have the discs. That wasn’t the case. The company that the discs were from put on the invoice that it was for donation for a non-profit and not for resale, but that didn’t seem to matter to the customs agent. A minute later, someone came walking from the back and said that I needed a customs broker. He didn’t speak much English, but I did understand that I needed someone to fill out paperwork for me and pick up the packages on my behalf. This was because Uruguay has a law that any package over $100 US Dollars needs to have official paperwork completed by an independent broker and properly paid for. They said there was nothing I could do without a customs broker. I was so confused. I don’t know where to find a customs broker, what they charge, how to talk to one, or anything about what to do next. Luckily, after being outside for a couple more minutes, Carlos, Chandro, and Maru came walking up. I told them what happened and what the customs people said and immediately, Chandro and Carlos were on the phone calling people. They both are great people and have great connections, but Chandro had a family friend who was a customs broker and agreed to meet us. We walked about 10 blocks through the city towards the port and arrived at his office. He met with us and was extremely friendly and gracious offering his services for free and helping. Without the normal upcharge percentage added on for needing to use a customs broker, he showed us that the taxes were going to cost about $450, which was roughly 60% of the final price of the discs with shipping. I don’t even want to know how much it would have cost with his fees. He said he would take care of it and for us to wait until next week. He was going to try and go through the donations and charity route, but worse case scenario, was going to get the discs for us and we would pay him whatever it costs. I hate waiting… BUT… after a week and a half, Chandro sent me a message on facebook and let me know the discs had arrived and we could pick them up. This time, Randi joined us for the fun. We figured it would be easier since it was originally addressed to her. There was a slight worry they would be confused since the address said Randi and not Miranda. We met up with Carlos and Chandro and walked to the office of the customs broker. He gave us the good news that we didn’t have to pay for anything. No taxes. No fees. Nothing. It was extremely exciting to hear, but there was still doubt since we didn’t have the discs in our hands. One of the employees of the custom broker’s office came with us. We were instructed not to talk or do anything and to let him talk. He didn’t say much at customs and handed over the papers that I originally gave them. They came back with three boxes and asked for Randi’s signature and passport. She signed the paperwork and the customs agent rolled the boxes around the counter for us. No fees or anything. When we left, the customs broker said bye, we thanked him a lot, and he went on his way. I felt as if I was 8 years old, running downstairs right after I opened my eyes on Christmas day to see the presents under the Christmas tree. It was so exciting. We couldn’t wait to get the boxes home and check out the designs. We took the boxes back by bus, got home, and opened them up. There were a lot of great designs, one from Kaimana Klassic, Emory University, Spin, VC, some that were glow-in-the-dark, different colors, and the majority were standard white discs with misprints. Asa, Randi, and I talked a little about how we were going to give them out and how to maximize them to help spread Ultimate in South America (mainly Uruguay and Argentina). So far, we have given out about 35 discs to the locals in Uruguay and some in a small town in Argentina called Bahia Banca. 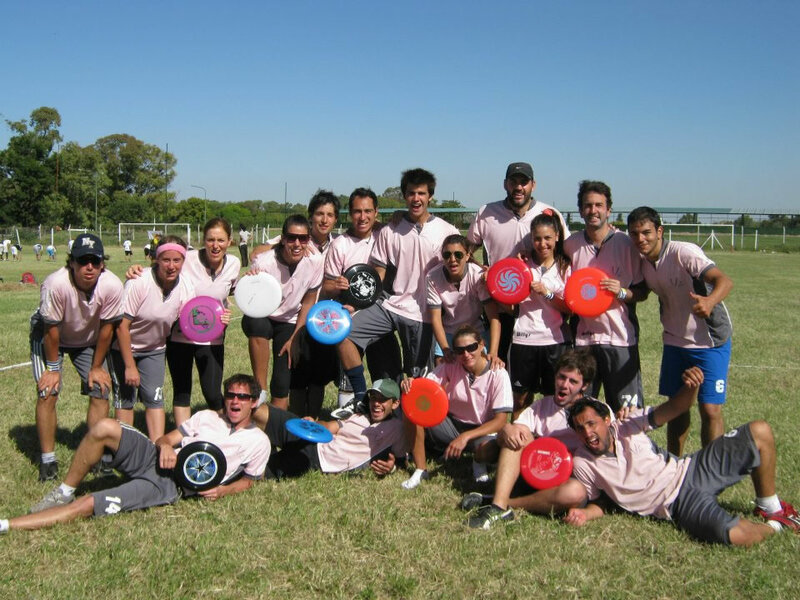 On a daily basis, they are telling people about ultimate, teaching at schools, physical education programs, youth centers, and bringing many youngsters out to learn the game and enjoy it. The most important part of ultimate to them is Spirit of the Game. VeC with their discs. They were extremely impressive with their efforts of teaching and helping the sport grow in Argentina. While we’re down here, we’re trying to teach everything we know about Ultimate Frisbee. One of the biggest problems is that no company sells real discs (Discraft discs) and each one costs about $30 US Dollars to buy because of shipping and import taxes (Great business opportunity if someone wants to take the time to figure out how to get discs here cheap). Without the discs that the AFDC so generously donated, kids down here wouldn’t be able to learn how to play with discs that fly. Some of the discs were duct-taped together. I don’t think you need me to tell you that they didn’t fly that well. Different departments of the government were trying to help buy creating a custom mold to create discs for kids to play with. The discs they created were really just circles of plastic with a huge hole in the middle. They donate fields to play on and help out with tournaments. Ultimate is slowly becoming more well known with the physical education teachers and government officials. It’s really awesome to have teachers come up to us and say how impressed they are with the sport, attitudes, and willingness to help others learn. Just recently, we were filmed at a practice for one of the largest news programs in Uruguay. We recorded it and are being sent a DVD from the program. If they give us permission, we’ll upload clips for all to see. Immediately after the program, people started sending facebook messages to players of the team saying they saw it on TV and it looked great. Beware USA and Japan, Uruguay might become the next great team to contend with at Worlds! This entry was posted in Adjusting, Ultimate and tagged AFDC.com, customs, customs broker, frisbee, sport, teaching ultimate, ultimate frisbees, Uruguay customs by Matt. Bookmark the permalink.